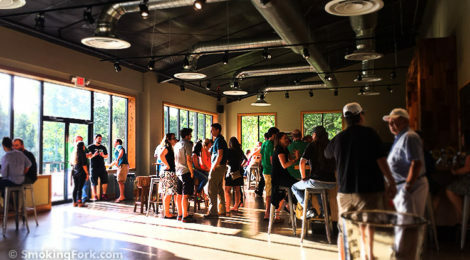 Everyone is thrilled that Swamp Head built a new facility with a much, much larger tasting room. It was kind of brutal on a busy evening. The small tasting room and overflow to the warehouse space (no air conditioning) was easily over crowded and whiffy (sweat). The new space is quite large, and has lots of tables and seating. But it faces west and catches the bright setting sun which can be a bit warm. And I’m not going to lie; it gets kind of loud from the echoes. The space is very open and bright and fresh. You can see where they have the room to develop a nice outdoor space overlooking a curated man-made pond. Or in the fullness of time, the patio can be enclosed and almost double the taproom floor space. Behind the cool bar, there are the usual standard brews on tap, plus a rotating selections of the fancier beers. And a few guest taps offer other Florida breweries’ productions. Again, you can see that there is room for expansion for more taps. They can also wash and fill growlers, which will come in handy after July 1st when the government clicks over and allows the sale of ‘normal’ size growlers. There is also the cooler where you can select bottle and canned beer to take home. Tuesday is brewery tour day, and the usual 5:30 and 6:30 times are expanded to a 7:30 tour. But still come early because they fill up fast. It’s only $5 and it includes a beer in a glass you can keep. It’s limited to 15 people each tour and it’s first come, first on the list. Please, please look at the new address before hopping in the car to go to Swamp Head. We’ve had several grumpy friends arrive late or call of the evening because they ended up at the old location (not actually possible now) or drove around looking for the new place. It’s tucked up in the industrial complex off of SW 34th, just north of the big Post Office. It shares a cul-de-sac with the old Alley Katz. *And check in to find out what’s on tap and special releases going on.